If you wanted to chill, do some yoga, enjoy a quiet cup of tea, today is your day to do it…. 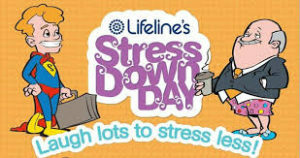 It’s Stress Down Day and employers are being reminded to look after their workers. 90% of Australians are stressed and 74% of them are stressed due to the workplace, so what can we do about it? Graeme Cowan is from the Workplace Mental Health And Resilience Authority and says stress may not always be a bad thing because it can motivate us but prolonged stress can be detrimental.